There isn't a secret to manifesting. There isn't a magic wand you can wave to instantly manifest your desires. Manifesting isn't a new concept that should be hidden in the realm of New Age thought. It's neither a blessing nor a curse. Manifesting is simply a part of life. It's been there since time began and it will continue for eons to come. The only thing that changes is that we begin to better understand how manifesting works and the things you can do to manifest your desires faster. Manifesting always has been, and always will be, a word that represents how you can create your reality through your thoughts and feelings. People often ask me how they can make their desires manifest faster. I can only tell them what worked for me…and what worked best for me was giving up the following things. I went from a state of wanting things to manifest to a state of alignment with my desires, allowing people, things, and experiences to flow into my life easily and effortlessly. Some of the things I tell you to give up are truths I haven't shared here before because I felt too vulnerable and exposed to share them. But I've committed myself to #7 this year, and it has truly made a difference in my life, and in how much faster my desires manifest. I hope they can help you manifest your desires too! This was a big one for me because I can be a perfectionist. I was always looking for what else I could do to make the Law of Attraction work. I kept thinking that if I could get things right or do more, things would manifest faster. This is so far from the truth! When you stop trying to do the Law of Attraction perfectly, you will manifest faster. Trying to do the Law of Attraction perfectly is a sign of attachment, resistance and limiting beliefs. Every time you think there is something else you can do that will make your desire manifest, every time you think you need to do things better, you're actually revealing that you do not trust your desire to manifest. I don't care if you want to meet Mr. Right or win the lottery, stop waiting for it to happen and start living your life. It's simple – the Law of Attraction states that your thoughts create. If you think that you're waiting for something to happen, you're creating more instances of waiting for it to happen. Mr. Right won't appear so long as you are waiting for him. All you're doing is aligning yourself energetically with waiting for him. He will appear if you go out and have fun! Meet people. Date. Live your life to the fullest, following your passions. Before you know it, Mr. Right will be there. In fact, he could be in your life now, but you don't see him because you keep manifesting waiting! Each time you say one of these words or phrases, your energy contracts causing you to block your ability to receive the very things you want to manifest. Even if you are speaking about something unrelated to what you want to manifest, these words will hinder your ability to manifest your desires. You aren't manifesting your desires in order to be happy. You won't be happy because you've lost weight, gotten the job, found the perfect partner, or moved into your dream house. It isn't the things you manifest that will make you happy, but being happy will make your desires manifest quickly. Your desires are just the destination. It is in the journey to them that the happiness awaits. I can't tell you how many times people have told me they've done everything they can to make the Law of Attraction work, but nothing is manifesting. They keep looking and looking, but they don't see anything changing. So often, people get in their own way when manifesting. They don't know how to let go. When you plant a seed, you don't keep digging it up to make sure it's growing. You put it in the ground and trust that it will grow. Manifesting isn't just about creating a vision board, writing a list, or doing a visualization. It's about surrendering to the process and trusting that everything is coming to you in the perfect way. You can't do the Law of Attraction right or wrong. It doesn't work or not work. The Law of Attraction isn't vision boards or affirmations. Those things are simply tools to help you become vibrationally aligned with your desires. The Law of Attraction is like the law of gravity. It's there whether you know about it or not. Just as the law of gravity tells us that what goes up must come down, the Law of Attraction tells us that what we are aligned with will manifest in our life. Be your authentic self. Give yourself the freedom to be you and to follow your heart. As you align with who you are on the inside, your external world will align to match your vision for it. Everything is an illusion. The only thing real is you. The world is yours to make of it what you want. How do you want to have fun, play and create? Are you trying to manifest something because you think you should? Do you think it will help you “fit in”? Do you think that if you have it you will be more loved, accepted, or popular? Make sure that you are seeking to manifest YOUR desires. Be adventurous, out-of-the-box, or quirky. The people that truly matter will love you for it. You will manifest your desires faster because you will be aligned with them. 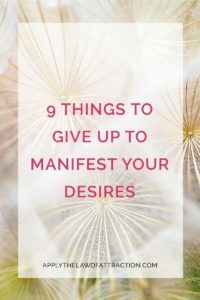 Did you enjoy these things to give up to manifest your desires? If you did, please share them with someone you know to help them manifest their desires too.